She's sassy, she's brilliant, she has the most amazing hair but most importantly she's a proper Cinderella for the mightiest of mighty girls. Our first Book of the Week this week is Interstellar Cinderella! It's almost impossible to overstate the importance of books like this to a book-loving dad who wants to give his daughter something cool to aspire to, and a book loving daughter who is fed up to the back teeth with primped prissy princesses clad in pink and simpering at handsome princes. We have seen many many reinventions of the classic tale of Cinderella but this book instantly caught my eye, thanks in no small part to its gorgeous uber-retro-styled artwork and steampunky- scifi setting. 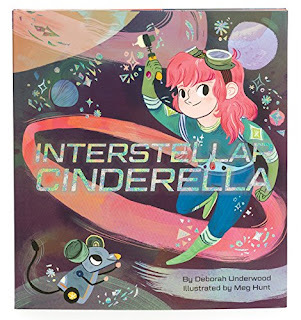 Most Cinderella stories stick fairly closely to the original formula, perhaps transposing the key characters for animals or swapping genders, but to have a Cinderella who aspires to be a rocketship mechanic? That's definitely a new one on us! Interstellar Cinderella. The coolest hair, the coolest sidekick. Cinders still has a couple of curmudgeonly sisters to have to contend with, and a wicked stepmother. When the family is invited to the Royal Space Ball, Cinders is once again left behind with only a broken spaceship to get her to the ball on time. 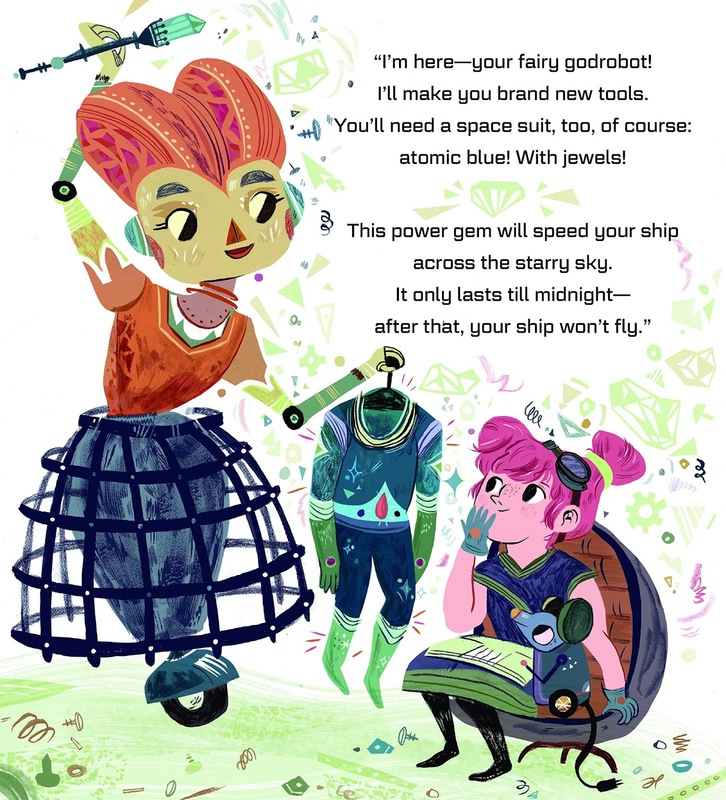 Thankfully her Fairy Godrobot is on hand to give Cinderella a rocket boost and some fancy new space mechanic duds. The space parade begins and the poor prince's rocketship lets him down, can Cinderella prove her worth and end up with a new friend into the bargain? We couldn't get enough of this book and didn't want it to end (but it's worth noting it ends fantastically too - none of your usual wishy washy "Cinders marries the prince and lives happily ever after" but a good uplifting and positive ending that fits the book's update of this classic story perfectly. It would actually be brilliant to see Deborah and Meg come up with more retellings of classic tales along similar lines but as it stands, this is a brilliant book for budding mighty girls with the sort of heroine we can't help but admire. Charlotte's favourite bit: Interstellar Cinderella's end papers with all the really cool and amazing spacey toolkits and gadgets. Daddy's favourite bit: Love everything about this! 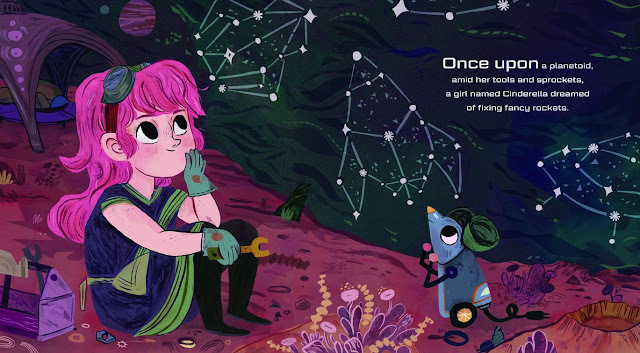 A great and original retelling, fabulous art in a spacey retrofuturistic style, and a solid positive mighty girl role model for girls everywhere to admire. Perfecto!